Free Shipping Included! FR Series 4'' Oval High Output LED Light (Blue Arrow) by OZ-USA at UCBC Group. MPN: FR-03. Hurry! Limited time offer. Offer valid only while supplies last. 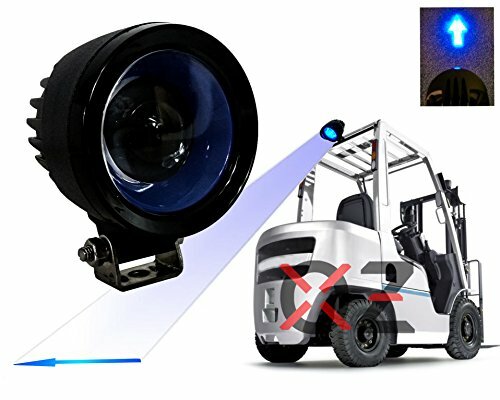 Blue Arrow Forklift LED Light Warehouse Safety Warning Lamp Spot Offroad Race 12V 48V Specifications: LED Power: 9Watt, CREE LED 3W/PC. LED Power: 9Watt, CREE LED 3W/PC. Diameter: 2.86" Depth: 2.75" Height: 3.75"
Operating Volt: 10-48 Volt DC. Light output about 450 lumen. Manufactured in China to OZ-USA's high end specifications. USA Shipping (California), USA Warranty: 1 year. 1 pc. OZ-USA Blue Arrow LED, spot beam safety light for forklifts or any industrial equipment. Projects an intense blue arrow ahead of the forklift to alert others of oncoming traffic. If you have any questions about this product by OZ-USA, contact us by completing and submitting the form below. If you are looking for a specif part number, please include it with your message.